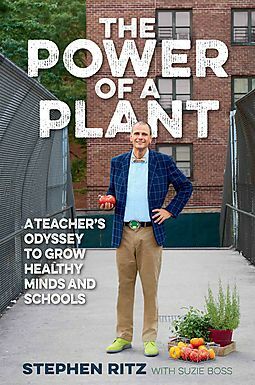 Just finished reading the amazing journey of Stephen Ritz ‘The Power of a Plant” chronicling his mission to grow healthy minds and Schools. Stephen runs Green Bronx Machine a 501(c)3 Organization. Its mission is to Build healthy, equitable, and resilient communities through inspired education, local food systems, and 21st Century workforce development. I believe this is a book not just for educators, but parents, and kids and anyone who wants to bring out a change. Stephen through his life has addressed not one but many factors that impact our communities. The need Healthy food, building self esteem, poverty, Joblessness, education, vocation are just a few of them. He ends the book with an interesting look at education. I loved his approach to education that adds a critical ‘A’ to STEM education making it STEAM and the ‘A’ stands for Art, Aspirations and Advocacy. He goes on to say that STEM is about career readiness. While that is important STEAM is about heart and soul; human expression, passion, purpose and hope. As he says in his book. STEAM is what will make our lives better. My 34th book in my Goodreads 50 Books in 2017 Challenge and I should say one of the most important book I read. Stephen, This world is better and hopeful because of people like you.